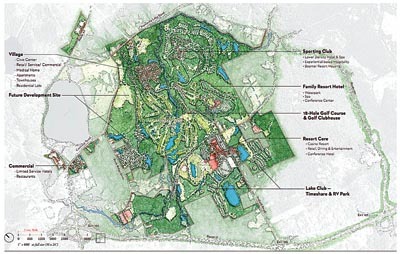 A plan of the proposed Concord project. On Wednesday, the Town of Thompson Board accepted two of the necessary environmental impact statements to push the development forward. MONTICELLO  January 4  The Town of Thompson Board had an unusually busy Wednesday as a noontime special meeting preceded the board’s annual organizational meeting at 7:30 p.m. The earlier, “special meeting,” stemmed from the board decision on December 18 to table the acceptance of the Draft Generic Environmental Impact Statement (DGEIS) and the Final Environmental Impact Statement (FEIS) from EPR Properties and Empire Resorts, the principal parties involved in the $600 million entertainment, housing and gambling complex on the grounds of the former Concord Resort. The December 18 decision to hold-off on the acceptance of the DGEIS/FEIS was initiated by Thompson Supervisor Tony Cellini, who wanted more time for his board to go over the documents which he claimed were dropped off only earlier that same afternoon. “They brought this in at about 3:30 this afternoon, and they expect us to go through that all by this evening?” asked Cellini on the 18th. Accordingly, the only items on the agenda at noon Monday, were the presentation and acceptance of the DGEIS/FEIS, which went exactly as planned this time around with the board voting unanimously to accept the documents, marking another big step in the completion of the huge project. Copyright © 1999-2013 Catskill-Delaware Publications. The information you receive online from the Sullivan County Democrat Online Edition is protected by the copyright laws of the United States. Content contained within this website is for the sole and exclusive use of Catskill-Delaware Publications. Please read our user agreement and our use information privacy statement.